Ideal for school, work and carrying your kit and essentials, protect your valuables with the Under Armour Hustle LDWR Backpack in Graphite. 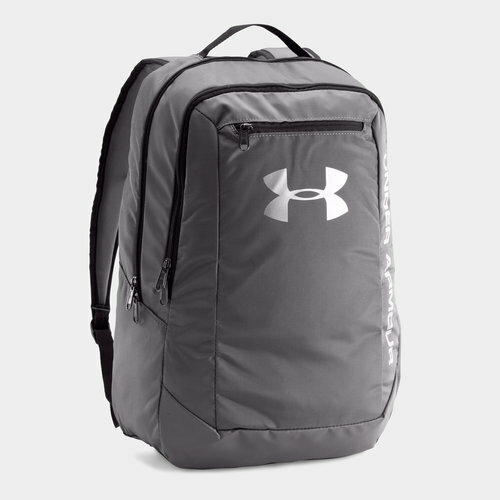 This Under Armour rucksack includes several zip fastened compartments for storage including a small front pocket, larger front pocket and a main compartment that includes a 15" interior laptop sleeve. A water bottle may also be stored in a side mesh pocket. A tough abrasion resistant bottom panel protects the bag from damage when rested on the ground. Made from 100% polyester material, Under Armour Storm technology ensures the fabric is water resistant so you can keep the contents inside dry. A handle at the top allows the bag to be carried by hand or hung up in the locker room whilst for heavier loads adjustable shoulder straps with padding and HeatGear mesh helps keep the wearer feeling comfortable and prevents overheating. Store your essentials in confidence and keep them safe and dry with the Under Armour Hustle LDWR Backpack, essential for any active person always on the go. Not all of our shirts can be personalised with the official number and letter prints. If we are unable to personalise your shirt with the official print then we will use our own prints. If you have any queries regarding your personalisation, please contact us by email at sales@lovellnetball.co.uk or on our freephone number 0808 164 6194.